The Sons Of Liberty - So Many Are Willing to Die For Her, How Many Are Willing to Live for Her? 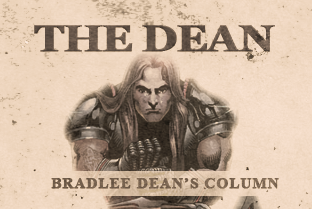 Home - The Dean-So Many Are Willing to Die For Her, How Many Are Willing to Live for Her? Friends, what would you think of me if I knew that the ship we were on was purposely being destroyed by a few outlaws (corruption in the government), blowing holes in the bottom of the ship in hopes of sinking it, and I sat back with a smile on my face asking others on the ship, "Who do you think blew the bigger hole?" Acting as if I were exempt from being on the same ship that everyone else was on! As I thought on this, it came to me that the problems with our country are not the media or the government's fault alone. The media watchdogs only stay afloat by the sponsors that support them, and the people are responsible for supporting the sponsors. In regard to government, government derives its just powers from the consent of "We the People," and the government in this country only reflects what the people tolerate. I also realized that our rights come from the hand of God, and those rights are maintained by fighting the good fight of faith (1 Timothy 6:12), which reflects what is, or is not, being preached from the pulpits across our land. I recently came across this quote that comes to my aid, "We now live in a nation where doctors destroy health, lawyers destroy justice, universities destroy knowledge, governments destroy freedom, the press destroys information, religion destroys morals, and our banks destroy the economy" (Isaiah 59, Leviticus 26, Deuteronomy 28). How, you may ask? Through what "they" tolerate others to do to the ship we are all on. Who is to blame? We often see the finger pointed at those who are only reflecting what is tolerated, as if to say that "they" are the problem. Who I ask, my friends, are "they"? If it is not the professed church decrying that there is nothing that they can do because iniquity has overtaken America, then it is the conservative of the day complaining about corruption in government. Iniquity has taken over the "professed" church and much of the government because "they" have been derelict of duty in honor to God, and love toward man, in the preservation of this most blessed country of ours. Gratitude leads to duty. Friends, "they" again are simply the American people, and until you take responsibility, nothing is going to change. As we have heard time and time again in the past six years, the change that was promised is not the change that we wanted or expected. Friends, indeed it has been a continual warfare in this country ever since I can remember. It has been war after war, scandal after scandal, lie after lie. It is going to sink our ship unless "We the People" take responsibility for what it is that we tolerate, both inside of the church and in our government. "Resistance to tyranny becomes the Christian and social duty of each individual. … Continue steadfast and, with a proper sense of your dependence on God, nobly defend those rights which heaven gave, and no man ought to take from us." – History of the United States of America, Vol. II, Page 229.